The Texas Rangers head to Turner Field on Tuesday, September 5, 2017 to take on the Atlanta Braves. The expected starting pitchers are Miguel Gonzalez for the Rangers and Julio Teheran for the Braves. The odds for this matchup have Texas at +121 and Atlanta at -131. The Rangers have a 61-70-5 over/under mark and a 76-60-0 run line record. The Braves are 70-65-0 against the run line and have a 69-62-4 over/under record. The Rangers have a 68-68 overall record this season. Starting pitcher Miguel Gonzalez has a 7-10 record with an earned run average of 4.31 and a WHIP of 1.44. He has 85 strikeouts over his 133.2 innings pitched and he's given up 145 hits. He allows 9.8 hits per 9 innings and he has a FIP of 4.56. The bullpen has an earned run average of 4.50 and they have given up 432 base hits on the year. Teams are hitting .260 against the bullpen and they've struck out 391 hitters and walked 194 batters. As a team, Texas allows 8.9 hits per nine innings while striking out 7 batters per nine innings. They are 14th in the league in team earned run average at 4.48. The Rangers pitchers collectively have given up 1,195 base hits and 600 earned runs. They have allowed 175 home runs this season, ranking them 12th in the league. Texas as a pitching staff has walked 474 batters and struck out 939. They have walked 3.5 men per 9 innings while striking out 7 per 9. They have a team WHIP of 1.38 and their FIP as a unit is 4.78. As a team Texas is hitting .247, good for 23rd in the league. The Rangers hold a .439 team slugging percentage and an on-base percentage of .325, which is good for 17th in baseball. They rank 25th in MLB with 8.3 hits per game. Elvis Andrus is hitting .301 with an on-base percentage of .342. He has 164 hits this season in 545 at bats with 76 runs batted in. He has a slugging percentage of .483 and an OPS+ of 112. Nomar Mazara is hitting .255 this year and he has an on-base percentage of .330. He has totaled 120 hits and he has driven in 87 men in 471 at bats. His OPS+ is 95 while his slugging percentage is at .425. The Rangers have 1,127 hits, including 209 doubles and 212 home runs. Texas has walked 472 times so far this season and they have struck out 1,230 times as a unit. They have left 860 men on base and have a team OPS of .764. They score 5.1 runs per contest and have scored a total of 693 runs this year. Atlanta has a 60-75 overall mark this year. With an earned run average of 4.75, Julio Teheran has a 9-11 record and a 1.35 WHIP. He has 128 strikeouts over the 157.1 innings he's pitched. He's also given up 156 hits. He allows 8.9 hits per nine innings and his FIP stands at 5.1. The bullpen has an earned run average of 4.69 and they have given up 405 base hits on the year. Teams are hitting .241 against the Braves bullpen. Their relievers have struck out 406 batters and walked 186 opposing hitters. As a team, Atlanta allows 9.1 hits per nine innings while striking out 7.7 batters per nine innings. They are 25th in the league in team earned run average at 4.77. The Braves pitchers as a team have surrendered 1,217 base knocks and 637 earned runs this season. They have given up 172 home runs this year, which ranks 14th in Major League Baseball. Atlanta as a staff has walked 491 hitters and struck out 1,032 batters. They give up a walk 3.7 times per 9 innings while they strike out 7.7 per 9. Their team WHIP is 1.42 while their FIP as a staff is 4.65. As a team, they are batting .264, good for 6th in the league. 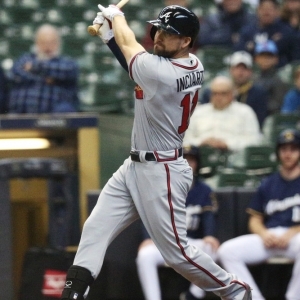 The Braves hold a .416 team slugging percentage and an on-base percentage of .326, which is good for 16th in baseball. They rank 5th in MLB with 9.1 hits per contest. Nick Markakis comes into this matchup batting .282 with an OBP of .361. He has 142 hits this year along with 68 RBI in 504 AB's. He maintains a slugging percentage of .401 with an OPS+ of 101. Ender Inciarte is hitting .307 this season and he has an OBP of .350. He has collected 175 hits in 570 at bats while driving in 50 runs. He has an OPS+ of 99 and a slugging percentage of .407. The Braves as a unit have 1,230 base hits, including 246 doubles and 140 homers. Atlanta has walked 386 times this year and they have struck out on 992 occasions. They have had 921 men left on base and have an OPS of .742. They have scored 4.59 runs per game and totaled 619 runs this season.